I was originally going to skip this article altogether, because it’s really hard to expand on “No.” But I’ll give it a shot. 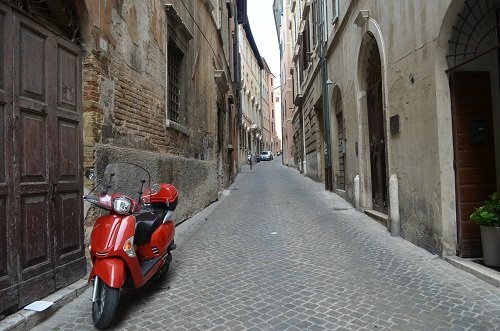 The only sign of life in Ancona is that at some point someone used this scooter. I can appreciate a coastal town (like Split) for what it is, especially in the summer when it’s starting to become more lively and full. 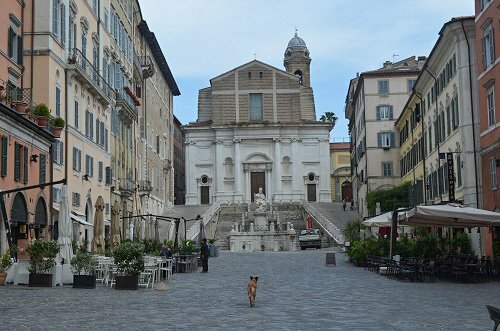 But Ancona is a ghost town, even now in early June. 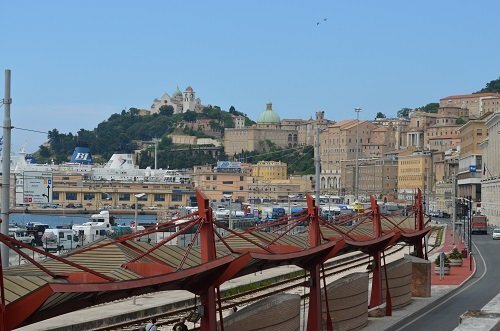 To be fair, why would you stay in Ancona when you can ferry from here to Croatia for as little as 10 Euro? The overall atmosphere is abandoned pretty Italian town. 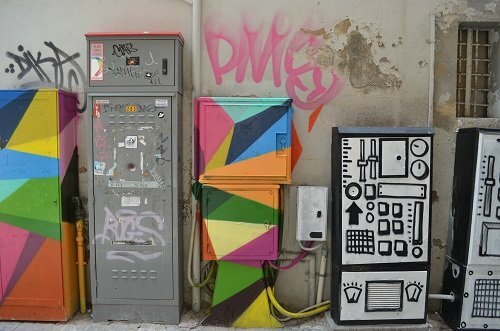 I can’t find a decent bar or café to sit in for a while and there is nothing particularly unique or interesting, even about its main sights. After wandering the desolate streets of Ancona, I found myself missing Bratislava. As far as I can tell, Ancona has one bus (the 11) that goes everywhere and comes once an hour. There’s no Uber here, so you’re basically on your own, which I normally don’t mind except this city is basically on a mountain so you have to hike everywhere you go. By the time you get up to see the Cathedral of San Ciriaco, you don’t really care anymore. You just need a bottle of a water and a change of clothes. So even visiting as a tourist blows. I can’t imagine hiking up these hills to get to work every day. We found one open pizza place and they had a 4 Euro cover charge. The pizza was okay, but it’s really hard to objectively rate something properly when you’re hungry and that’s your only option. The Airbnb apartment we rented is so high up a hill and so much better than the rest of Ancona that we’re basically cooking and drinking here until it’s time to leave. You can get a great bottle of red for less than 3 Euro. After the grueling hike we had to get back to the apartment our first night here, I took an hour-long bubble bath and had almost an entire bottle of wine and it was one of the best nights I’ve had this entire trip. This poor dog is also looking for company in Ancona. If I moved to Ancona, I would probably be the city’s 100th resident. I’ve seen maybe five people who look like they reside here, including the woman and her boyfriend who have turned this gorgeous apartment into a business. I imagine that the people who work in the one open restaurant commute here from San Marino, because that’s the only thing that could explain their attitude. So despite being a tiny, boring town, it has none of the charm and kindness you expect from a tiny, boring town. I would love to know how much the apartment I’m staying in costs so I can rent one and Airbnb it out to unsuspecting folks who think this is a good place to visit. 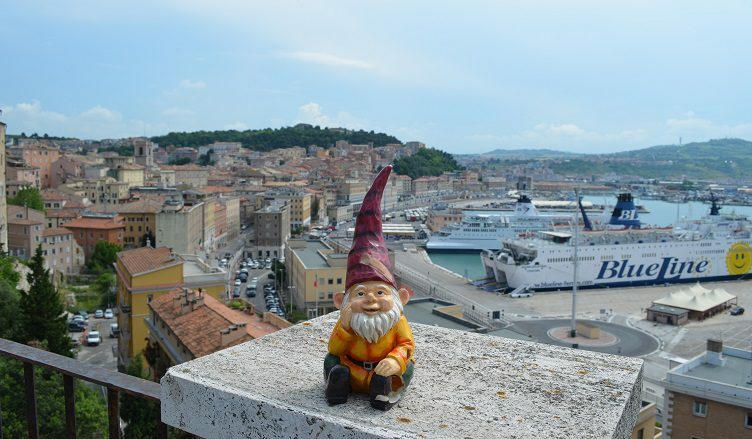 Overall, Italy is cheap; Ancona is, too. Especially if you’re on a wine and pizza diet. You also save on the cost of a gym; visiting here is like a CrossFit membership I never wanted. Not only would I never live here, I would never willingly return. But it’s turned out to be a great place to get wine drunk and take bubble baths, so there’s that. There’s this, too. I liked this.